Have you been to Pipeline Road? Do you enjoy being immersed in beautiful nature? Just 50 minutes from Panama City near a village called “Gamboa” there is Soberania National Park, where you can find amazing bird diversity, monkeys, sloths, insects and beautiful Flora! Hike through the historical pipeline road. Oh, what is the pipeline road? During World War 2, across the isthmus of Panama, a petroleum pipeline and its service road were built, which allows the entry through the center of this marvelous national park. After the hiking, enjoy a boat trip through the canal, where you will see those breathtaking, giant ships passing by a few steps from you, until you’ll end up in the Gatun lake! Do you want to know why and in which situations the Alpha Monkeys in the rain forest starts to yowl? Our great Guide Jorge will tell you all about the animals in this amazing National park, the history of the pipeline, the canal and much more on this beautiful tour! When you arrive to Panama City you will be comfortably housed at the Country Inn and Suites Amador out on the Causeway, where more than 40 shore birds are waiting to be spotted by you as soon as you have checked in and dropped your bags. You start off on your third day in Panama with a visit to Metropolitan National Park. Situated only 15 minutes from downtown Panama City, it is the most accessible rainforest in the region and the only tropical forest in Latin America located inside a major urban center. The Park is characterized by the increasingly rare dry lowland pacific forest and is home of the Two- and Three-toed Sloth as well as over 200 bird species. Take your time spotting and identifying them with your specialist guide, who will accompany you for the expedition. To give your spotter’s guide no rest, you will spend your next nights at Canopy Tower Lodge in the rainforest of Soberania Park. With bedrooms at treetop level and a viewing platform atop the tower, you cannot possibly miss sighting a variety of birds, among them Blue Cotingas and Green Shrike-Vireos, while you are still having your morning coffee. Continue the next day to Panama’s Pipeline Road, where the Audubon Society once spotted 300 species of birds in a single day – one of the best birding spots in the world. Located in the Panama Canal watershed, this former US military access road takes you into old growth secondary forest, ideal for the observation of flora and fauna from the Pacific and Caribbean slopes. The tour begins with a preparatory talk about the geography and animal life of the Panama Canal areas by your expert guide. Soon you will be enjoying an easy walk under the forest canopy into a veritable bird sanctuary. Keep your binoculars at the ready! For day five, get ready to explore Plantation Road in Soberania National Park. This road was the first paved road that went into the interior of the country during the time of the cocoa plantations. Thie trail is approximately 4.8 kilometers long and connects with the famous Camino de las Cruces Trail that was used to transport riches from South America. Some of the typical birds that may be observed are Tinamous, leaftossers, Golden-crowned Spadebills, White-breasted Wood-Wrens, Spotted, Bicolored and Ocellated Antbirds, Gray-headed Tanagers, and Plain-brown, Northern Barred and Ruddy Woodcreepers, and Hook-billed Kite. As you have now thoroughly explored Soberania national park, the following day it is time to visit San Lorenzo, on the Atlantic side of Panama, taking one of the most scenic drives in central Panama. From the road you will be able to see remnants of the old sea level French Canal, drive through wooded hills and will be able to reach the Gatun Locks. The woodland along the road is noted for Trogons, Motmots and numerous other forest and woodland birds. Then head to Achiote Road and hike the CEASPA new trail for other species such as White-headed and Stripe-breasted Wrens and Montezuma Oropendolas among others. Return in the evening for your last night’s stay in Canopy tower. Rise early the next day for your journey to El Valle, where you get comfortably accommodated at Canopy Lodge, Canopy Tower’s sister Lodge in the mountains. Here, each day is pleasantly cool early and late, and pleasantly warm mid-day. The habitats are varied, the birds diverse and numerous, the accommodations extremely comfortable and tastefully appointed, and the food tasty and creative. The Lodge serves as a splendid base for birding and makes for a perfect tour for spouses who might be “lite” birders. Still missing Tody Motmot or Rosy Thrush-Tanager on your spotting list? Or how about Black-crowned Antpitta or Rufous-browed Tyrannulet? Your chances are good to find them here as you explore with your guide around the Lodge. 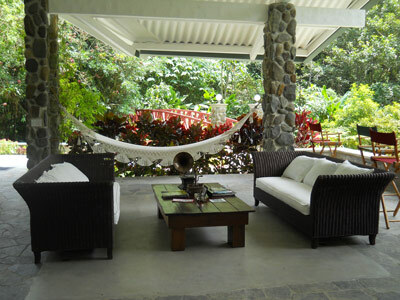 Sleep in the next morning, then stroll on your own to bird a waterfall area behind the Lodge known as Chorro de Macho. With some luck, you may find a roosting Mottled Owl to make today’s top spotted bird. A short distance from the Lodge, the Cerro Gaital Trail begins at the main road in La Mesa. This area is protected as part of Cerro Gaital Natural Monument. So rise early on day 10 to make sure you get to see it all: Leading through prime cloud forest habitat, the trail starts out flat and wide. 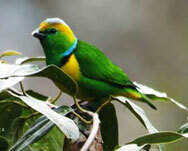 This first portion of the trail is often very birdy, with foraging flocks of tanagers and other species. Flowering trees along the trail attract Green-crowned Brilliant and the occasional Green Thorntail among the more common hummingbird species. The next portion of trail ascends more steeply and deeper into the cloud forest. Purplish-backed Quail-Doves are often heard calling and it is also where the first Common Bush-Tanagers are often spotted. Higher up, the trail levels out again and weaves through excellent cloud forest habitat. Here we will be watching for Black Guan, White-ruffed Manakin, Gray-breasted Wood-Wren, Chestnut-capped Brush-Finch, and even Blue Seedeater in addition to other species. Rarities here include Red-faced Spinetail, Spotted Barbtail, and Black-headed Antthrush. Managing to see just a couple of these would be a real feat. This area can be good for Barred Hawk and Red-shouldered Parrotlet. In the late afternoon you will return to Panama City. 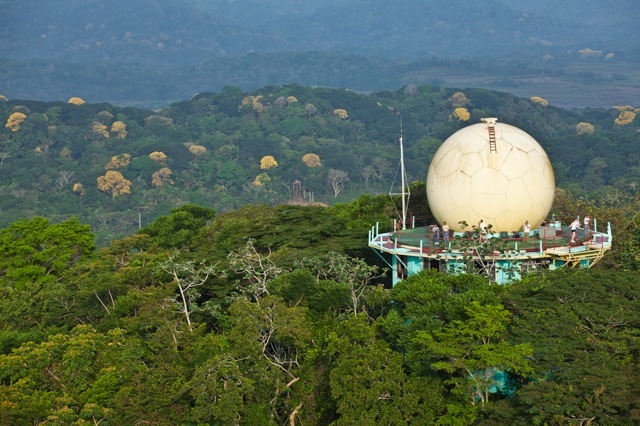 Your final visit on this tour will be to Birders View, a famous birding spot with imposing views of the Chagres National Park. The gardens and feeders attract a variety of colorful tanagers, such as Bay-headed Tanager, Emerald Tanager, Rufous-winged Tanager and Speckled Tanager. Hummingbirds include: Bronzed-Tailed Plummeteer (A hummer with pink feet), Violet-capped Hummingbird and the sought after Rufous-crested Coquette. Spend your last night at the Country Inn and Suites on the Causeway again, before being transferred to the airport the next day for your flight home. Did you know the Shining Honeycreeper? The Shining Honeycreeper is a small bird in the tanager family. It is found in the tropical New World in Central America from southern Mexico to Panama and northwest Colombia. It is sometimes considered to be conspecific with the Purple Hon eycreeper, but the two species breed sympatrically in eastern Panama and northwest Colombia. This is a forest canopy species, but also occurs in forest edges and secondary growth. The female builds a shallow cup nest in a tree, and incubates the clutch of two eggs. 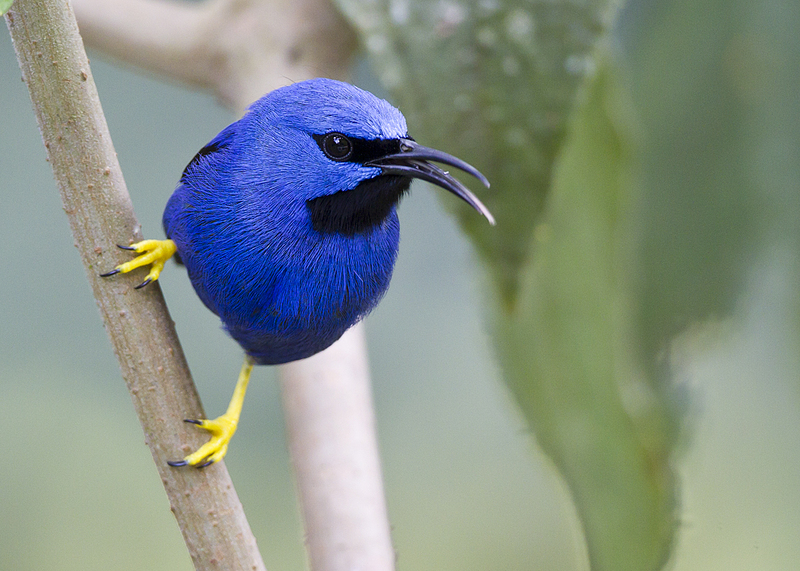 The Shining Honeycreeper is 10 cm long, weighs 11 g and has a long black decurved bill. The male is purple-blue with black wings, tail and throat, and bright yellow legs. The female has green upperparts, a greenish-blue head, buff throat and buff-streaked bluish underparts. The immature is similar to the female, but is greener on the head and breast. Panama is a paradise for bird enthusiast and we will offer an unforgettable birdwatching experience along the Isthmus of Panama. We invite you to participate in our Best of Panama tour along our country for 12 days and 11 nights.